You see that image there? That is the sweet taste from the cake of victory. 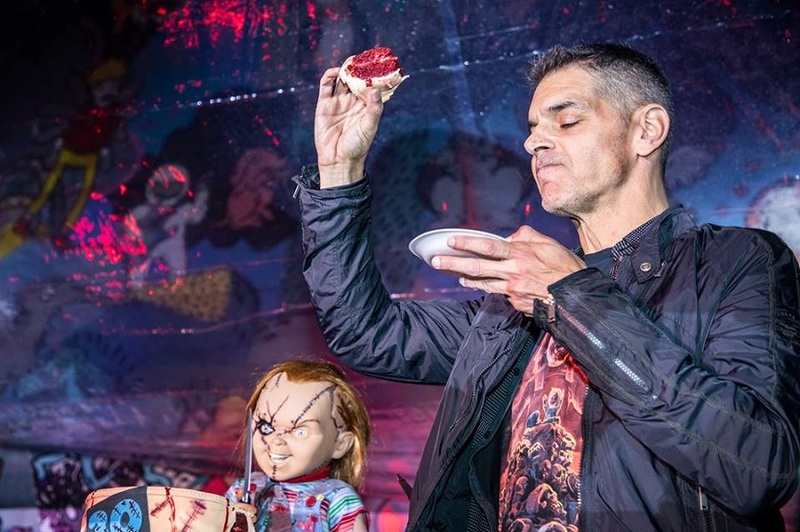 This image of Don Mancini during his visit to the Morbido Film Festival last Fall is perfect for today's news from Deadline that he and Child's Play producer David Kirschner will work with SyFy to create a Chucky television series for the network. Why is this a victory? Well, we have heard things about the newest Chucky film, as you all have. Lots of things, Things that change up what we knew of our favorite little demonically animated doll that quite frankly do not need to be changed. We have heard things from lots of people that were asked to be involved, and those not asked to be involved. But all that does not matter if the original creators of the franchise can hold on to the original roots of the series, the things that we love about Chucky, that make him who he is. Mancini is going to write the adaptation. He and Kirschner executive produce the series. They will be working with Channel Zero's Nick Antosca under his banner Eat the Cat.